Cream butter with mixer on medium speed until light and fluffy; 1 to 2 minutes. Add brown sugar, increase speed to medium-high, and beat until combined and fluffy, about 1 minute longer. Add eggs one at a time, beating thoroughly before adding the next. Beat in vanilla, molasses, and sour cream until thoroughly combined and creamy, about 1 minute longer. Reduce speed to low; beat in muttermilk and half the flour mixture until combined, about 1 minute. Beat in remaining flour mixture until incorporated and slightly curdled looking, about 1 minute longer, scraping sides of bowl as necessary. Stir in bran and raisins, if using (I didn't use raisins). Spray 12-cup muffin tin with vegetable cooking spray or coat lightly with butter. 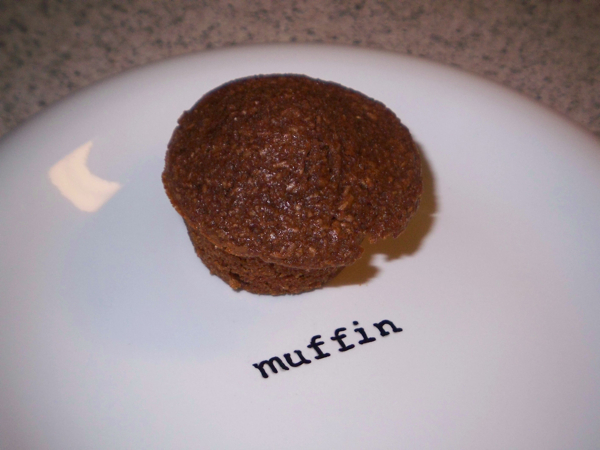 (Jamie note: I used a 24-cup mini muffin tin and Baker's Joy cooking spray). Divide batter evenly among the cups. Bake until a toothpick inserted into center withdraws cleanly or with a few moist particles adhering to it, about 25 minutes. (Jamie note: with the mini muffin tin, it only took 15 minutes of baking to get to the desired doneness). Set on wire rack to cool slightly, about 5 minutes. Remove muffins from tin and serve warm. Serving suggestion: These are great on their own, but when I put a small pad of butter in the middle they were heavenly. I think tomorrow morning I'll try mixing some cinnamon and sugar into a room temperature knob of butter and spreading a little of that on them. * If you don't have buttermilk, you can do what I did and make your own. Pour 1 tablespoon plus ½ teaspoon distilled white vinegar into a measuring cup. Pour milk over the vinegar up to the 1 cup mark and add 3 more tablespoons of milk to bring it up to the amount called for in this recipe. Wait at least 5 minutes before using.